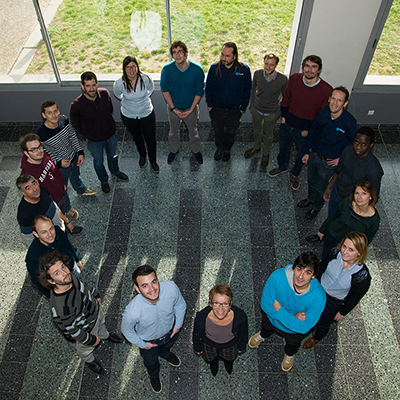 We are an academic research team of GeoRessources, a research unit of the Université de Lorraine, Centre National de la Recherche Scientifique and CREGU, located in the facilities of the École Nationale Supérieure de Géologie in Vandoeuvre-lès-Nancy. Combining geosciences, applied mathematics, and computer programming, we do methodological research to describe the geometry and heterogeneities of the subsurface consistently with observations (big, sparse and wide data) and geological concepts. This research is done in partnership with academia and industry and capitalizes on 30 years of geomodeling expertise. 21st century earth modeling is a tool to explore subsurface uncertainties, test geological scenarios, integrate across several physical simulators at the appropriate scale and finally support decisions. We develop game-changing subsurface modeling technology to support industry and academia in better understanding subsurface processes and addressing natural resource management challenges. As an academic research group, we also develop multidisciplinary skills in geoscience, software and engineering at the undergraduate and graduate levels to help students to understand, use, improve and test earth modeling software. Community: We value community both in the research group and in the community formed by our academic and industry partners to exchange and collaborate. Multidisciplinary: We are curious and firmly believe that the combination of knowledge from various areas creates value. Expertise: We aim at the best science and technology. Critical Thinking and Creativity: We like to identify and bridge gaps with out-of-the-box thinking. Integrity: We admit that a solution is seldom perfect and explicitly state our working hypotheses. RING finds its origin in the long tradition of combined engineering and Geosciences of the Nancy School of Geology, which has considered computer programming as part of the modern geologist's toolbox since the time of punch cards. Following the development of several automatic contouring methods in the 70's and 80's (GEOL, Cartolab), the research group increased its international recognition since the gOcad project was initiated in 1989 by Prof. Jean-Laurent Mallet. Since 2007, the research consortium and the research group have been directed by Guillaume Caumon. The structure has been continuing exploring and pushing the limits of geomodeling technology through original R&D. Improve one's understanding of earth processes to meet natural ressource challenges. Royalty free integrated in commercial software by our sponsors. Educate and share expertise in geoscience, software and engineering.